Standing out in a crowd of 3,200 exhibitors is tough, even when your name is Panasonic Corporation. For its participation at the 2014 International CES event, Panasonic relied on Noble’s expertise to help cut through all of that clutter. After all, the event features more than 300 sessions and 160,000 attendees and is one of the world’s largest annual attractions for business leaders and pioneering thinkers. What Panasonic needed was an engaging digital hub to share all of its CES news and events with the world. Noble Studios collaborated with Google, Panasonic and Mass Relevance to capture the social buzz of the Panasonic exhibit, highlighting 2014 products and showcasing two days of live events held at the Panasonic CES booth. The live-streamed events highlighted technology leaders in avionics, fashion/beauty, automotive, video, photography and music. We designed and built a responsive microsite that reflected Panasonic’s new, lighter branding. Instead of the black, grey and red Panasonic had used over the years, the new branding conveyed movement and an atmospheric personality. The textures and lighter colors were incorporated into the landing page to ensure a cohesive experience between the website and what visitors experienced at the Panasonic booth. We also considered the theme of movement when creating the subtle interactions with the site. We incorporated smooth rollovers on product blocks and timed animations on the social feed to show that the site was updating in real time during the event. 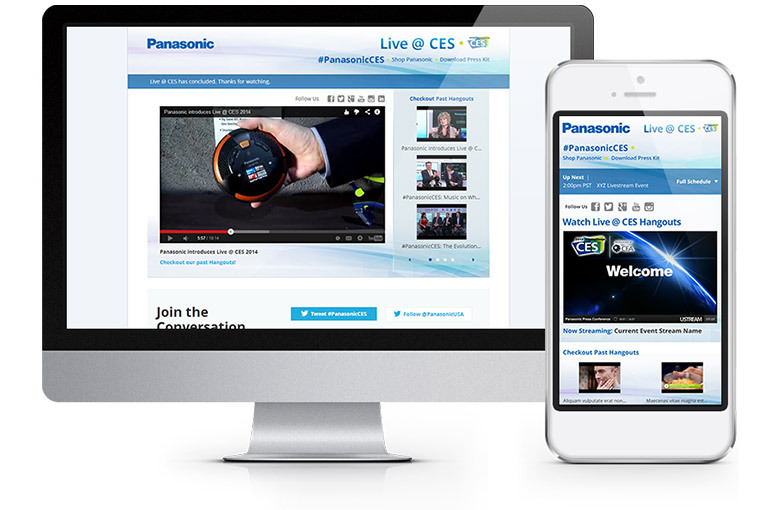 The site featured: livestreaming of events alongside previously aired events (using Google+ Hangouts and the YouTube API), as well as two social feeds provided by Mass Relevance to showcase Tweets and images posted to Instagram using the #PanasonicCES hashtag. Because the microsite was built to be used for a very short duration with concentrated visits, it was imperative the application be capable of withstanding high levels of traffic. The project was so successful the Panasonic team asked us to recreate the microsite for its next event, NAB Show 2014, which is the world’s largest electronic media show.